Android has become the most popular computing platform on the planet, but Google has had problems selling very many Android phones itself. It tried for years to make Nexus devices “a thing,” but they never caught on outside the nerd demographic. With the debut of the Pixel program in 2016, the company took a different approach—it started building smartphones with consumers in mind. Google hasn’t done everything perfectly, but it’s gotten enough right that the first and second generation Pixels have been relatively easy to recommend. That brings us to the third-gen Pixels. These devices rightly focus on strengths like camera performance and software, but the hardware also feels high-end. Google found a way to make a glass phone I don’t hate holding, and the display quality good. Of course, the Pixel 3 XL has the divisive notch at the top, but its smaller sibling has slim “normal” bezels. Google is asking more for this year’s Pixels, which start at $800-900. That is, objectively, a lot of money, and many will scoff at paying that much for a phone with a giant, dopey notch. I’m not going to tell you the Pixel 3 XL is an attractive device, but the bottom line is this: if you’re buying a new phone right now, it should be one of the new Pixels. This review is brought to you by dbrand, one of the first partners in the Made For Google program offering officially licensed Google Accessories. The first-generation Pixel and Pixel XL were carbon copies of each other, but the designs diverged in 2017, and the larger phone had a questionable OLED. This year, the two devices again look quite different. However, both of them have similarly high-quality builds. Let’s start where the phones are the same: on the back. 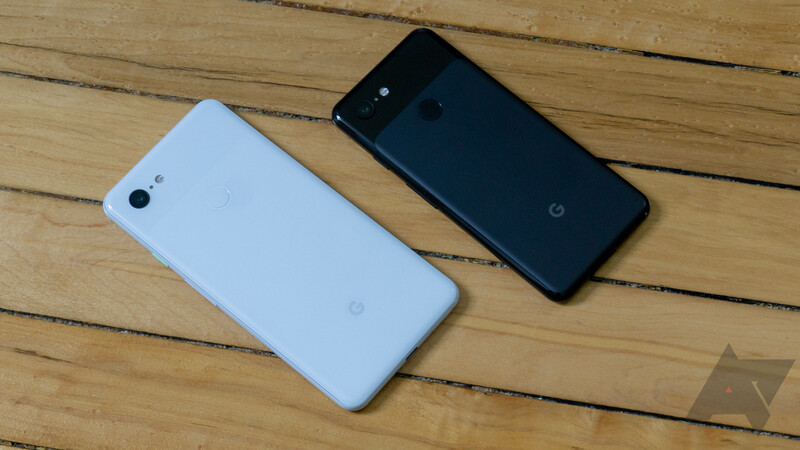 Google’s decision to make the new Pixels out of glass closes the door on the era of aluminum flagships. The Pixels have a rear glass panel, but the bottom three-quarters are etched to give it a matte finish that doesn’t pick up fingerprints. The two different textures maintain the “Pixel” style without using two materials. The glass back also allows the Pixels to charge wirelessly, but it’s only 10W versus 18W with a cable. The Pixel 3 has a 2,915mAh battery, and the 3 XL is 3,430 mAh. Both will get you through a day just fine, but the XL runs longer even with the larger screen. The rear-facing fingerprint sensor is accurate, but the speed is just average. The phones’ frame is polished aluminum, which is somewhat slippery but attractive. On the bottom edge, you get a single USB Type-C port, and that’s still the only port on the device. The age of the headphone jack is ending—I don’t like it, you probably don’t like it either, but that’s it. Over on the right, there’s the volume rocker and a power button. Like last year’s Pixels, the power button might add a little splash of color, depending on the version of the phone you get. Although, it’s plastic and feels a bit wobbly compared to the volume rocker. The Pixels come in black, white, and pink, but the pink is a very pale shade. I don’t understand Google’s aversion to making fun colors. The first-gen Very Blue Pixel was hot, but the company has been doing subdued colors ever since. I have black and white Pixels to test, and between them, the white looks nicer. They feel the same, but the black Pixel tends to pick up temporary scuffs. They wipe off, but the white just looks cleaner, and the mint power button in fun. A few people say those scuffs and scratches are permanent, but that has not been my experience. It might be better to stick it in a case, just to be safe. The displays set the two Pixels apart… way apart. The Pixel 3 has a 5.5-inch 2280×1080 OLED, so that’s an 18:9 display, which is an upgrade from last year’s small Pixel. The 3 XL has a 6.3-inch OLED with a resolution of 2960×1440 (18.5:9). You also get the dreaded notch at the top of the XL screen, making room for the cameras and earpiece/speaker. There’s a “chin” at the bottom of the phone, giving it a strange asymmetric vibe that I don’t like. The small Pixel has all those same internals, but it has normal top and bottom bezels. Last year’s Pixel 2 XL had some OLED quality issues, but those are mostly resolved this year. At low brightness levels, there’s slight unevenness in the OLED panel. However, the “texture” isn’t as noticeable as it was on the 2 XL. Colors are much better, too. I have noticed a tiny blue shift at extreme angles once or twice, but it’s very minor compared to last year. At this point, I don’t think you’ll notice the color casting unless you’re hunting for it. The maximum brightness is good enough to be legible under bright light, but it won’t outshine a phone like the Note 9. The new Pixels ship with a clean, fast version of Android 9 Pie including a smattering of temporary and permanently exclusive features like Flip to Shhh, Pixel Stand integration, Call Screen (it’s magical), and all the camera goodies. Google promises three years of full update support. So, these phones will get Android Q, R, and S updates in addition to monthly security patches. You also get a bit more gear in the box with this year’s Pixels. That doesn’t justify the price increase all on its own, but every little bit helps. The phone is right on top, and below that, you’ve got a sleeve with the warranty info, quick start guide, a SIM ejector, and some Google stickers (yay stickers). Next, you have a small folder with the new Type-C earbuds. They sound better than most stock earbuds, and they’re reasonably comfortable (at least in my ears). Take those out, and you get the remainder of your accessories: a C-to-C cable, a 3.5mm adapter, and a USB C-to-A (female) adapter. There’s also the plug, which does 18W fast charging. The Pixel 3 and 3 XL still sport a single 12.2MP rear-facing camera, which seems odd at first glance. Everyone has moved to at least two cameras on flagship phones, and some are pushing the envelope with three or even four cameras on the back. Even with a seeming hardware disadvantage, Google remains the camera king. No other Android phone can touch the Pixel’s photo quality. I’ve been nothing short of blown away by Motion Auto Focus, which is one of the camera features exclusive to the Pixel 3 and 3 XL. You can tap on anything in the viewfinder, and the phone tracks it around the frame so it remains in focus and properly exposed. This is useful for getting a close-up shot as you play around with composition, as well as trying to keep a moving object in focus while you snap photos. I tested this with my spastic dog running around the backyard, and it worked incredibly well. Other phones have implemented features like this in the past, but Google’s version is more powerful and reliable. The Pixel 3’s camera is fast—it opens quicker than other phones, and processing speed has been improved this year. In most cases, the HDR+ processing will be complete before you can open the preview. David reports he’s seen a bug that intermittently eats photos, but this hasn’t happened to me. I appreciate that Google’s image processing maintains good detail and contrast without oversharpening. Some phones go crazy, artificially boosting the contrast, but end up obliterating fine details. The Pixel 3 also has an enhanced digital zoom, and it’s very impressive. When you zoom in, it captures multiple frames to sharpen the resulting image and compensate for the loss of resolution. The results don’t look quite as good as an optically zoomed photo, but they’re better than I expected. CHECK OUT: Meet the Google’s New Video Conferencing App For Businesses. Night Shot is not live at the time of this review, but the Pixel’s low-light shots are still best-in-class. It extracts a ton of detail without blowing out parts of the image or cranking up the shutter speed too high. So many phones have trouble keeping the white balance right in darker conditions, but Google nails it almost every time. Indoor images under certain lighting can look too warm at times, but the Pixel still outperforms all the other phones I’ve used lately. Thanks to Google’s focus on computational photography, I expect the Pixel camera to get even better as time goes on. Yes. The Pixel 3 might not have as many features as the Note 9 or the low price tag of OnePlus’ phones. Yet, it has the best version of Android you can get and a camera that blows everyone else out of the water. The build quality of these devices seems excellent with glass bodies that don’t immediately become a greasy mess. Performance is solid with smooth, fluid animations and efficient use of memory. Yes, you only have 4GB of RAM, but that hasn’t slowed me down. What some OEMs accomplish with brute force, Google accomplishes with finesse. The value of consistent monthly software updates cannot be overstated, either. What some OEMs accomplish with brute force, Google accomplishes with finesse. You might be irked about the lower RAM or smaller battery compared to some other flagships. But I don’t think you ought to stress—Google’s Android build is well optimized and feels more consistent than other phones. Going from a Samsung or LG device to the Pixel 3 is a revelatory experience. Everything is so fast and effortless you almost can’t believe it. Everyone talks a big game when it comes to camera quality—even budget phones with crummy cameras claim to take “studio-quality” or “stunning” photos. Google’s claims are not just marketing nonsense. With the Pixel 3, you don’t have to tinker with settings or take five different images just to get one that’s good. You can say that of past Pixels, but the Pixel 3 has improved processing and capture speed, plus there’s substantially better digital zoom. It also has Motion Auto Focus, which is probably the best new-ish camera feature in several years. I like the way these phones feel in the hand, and that’s not something I ever thought I’d say about a glass phone. The etching process on the back panel hides fingerprints and just feels nicer than slippery, shiny glass. The Pixel does get a bit of a sheen over time, but you can clean it, and it’s far less offensive (to me) than fingerprints. In general, the build quality is a step up, especially for the smaller Pixel. I know, it’s $150 more expensive, but the look and feel of the Pixel 3 is on an entirely different level compared to the Pixel 2. Legible in direct sunlight, but not the brightest. This year, you don’t have to choose between a good little screen and an okay-ish big one. The Pixel 3 and 3 XL both use the same OLED technology, and it’s much better than the Pixel 2 XL’s LG panel. I assume these are still made by LG because they’re not quite up to the level of a modern Samsung OLED, but the improvement after just one year is impressive. The panel is definitely more consistent, but that didn’t bother me too much last year, and it’s even less problematic now. I’d say the same goes for the blue shift. It’s less obvious, and I’ve been trying to look for it. I don’t think this should figure significantly in your decision. The Pixel 3 XL’s notch probably will affect your decision. The Pixel 3 XL offers a 6.3-inch screen, but the notch means some of it is wasted on a double-height status bar. I’ve found it’s not the height of the notch that bothers me so much; it’s the width. You’re missing enough of the status bar that Google has to hide some status icons on the right. Some lower-priority icons end up in an overflow list when you open the notifications. Sometimes, I can’t tell if do not disturb or my alarm are enabled at a glance because the icons are in the overflow. You can change the display scaling to fit more in the status bar, but that makes things look too small for my taste. If you don’t like the notch, the smaller Pixel 3 is here to save the day. The 5.5-inch diagonal measurement is the same as the first-gen Pixel XL, but the Pixel 3 is easier to use one-handed thanks to the taller ratio. The battery in this phone is smaller, but the smaller screen seems to even it out. I’ve seen over five hours of screen time on the Pixel 3 with heavy use over the course of a day, and the 3 XL can manage about an hour more. With lighter use, a day and a half is within reach. They’re both above average compared to other Android phones. It took a while, but I’ve grown to really like the look and feel of Android Pie. It’s not all good news on the software side, though. I still don’t care much for Google’s version of gesture navigation. It makes opening the app drawer tedious, and the back button hanging out on the left looks strange. It’s also weird that Google would go to the effort of changing the navigation paradigm and keep the ugly filled-in navigation bar background. There is no option in the settings to go back to the buttons, either. I’m sure someone will come up with a hack to turn them back on, but Google is all-in with gesture nav. You might as well get used to it. I’m trying. Live wallpapers show through in Ambient Display mode. Sometimes this looks good, and other times not so much. The cost will be tougher to justify this year than in years past, but all flagship phones are getting more expensive. The Note 9 launched at $1,000, and I’m sure that will be the benchmark for the ultra-high-end going forward. The Pixels are a little cheaper, but they don’t have as many features, and the OLED isn’t as good. However, if I were buying a new phone right now, it would be the 5.5-inch Pixel 3. It has the best combination of hardware and software at the moment, and it gets bonus points for being “small” without compromised hardware. If you hate waiting on Android updates or using clunky software, and you want to take the best photos possible with your phone. If you want a big phone and refuse to spend $900 on something with a sizeable display notch. Now that you’ve pre-ordered your Pixel 3, now it’s time to protect your $800+ investment. The first layer of defense—and the ultimate layer of customization—is a dbrand skin. They’re available now, ready to protect and enhance from day one. As officially licensed Google accessories, there’s no better place to get a Pixel 3 skin, or Pixel 3 XL skin. You can customize the front, the back, just the back glass, and even the G logo (the special edition 4-color G looks sick). Click the link to check out dbrand Pixel skins.